California sea lions are known for their intelligence, playfulness, and noisy barking. Their color ranges from chocolate brown in males to a lighter, golden brown in females. Males reach 850 pounds (390 kg) and seven feet (2.1 m) in length. Females grow to 220 pounds (110 kg) and up to six feet (1.8 m) in length. They have a “dog-like” face, and at around five years of age, males develop a bony bump on top of their skull called a sagittal crest. The top of a male’s head often gets lighter in color with age. These members of the otariid or walking seal family have external ear flaps and large flippers that they use to “walk” on land. The trained “seals” in zoos and aquariums are usually California sea lions. California sea lions are found from Vancouver Island, British Columbia to the southern tip of Baja California in Mexico. They breed mainly on offshore islands, ranging from southern California’s Channel Islands south to Mexico, although a few pups have been born on Año Nuevo and the Farallon Islands in central California. There is a distinct population of California sea lions at the Galapagos Islands. A third population in the Sea of Japan became extinct, probably during World War II. 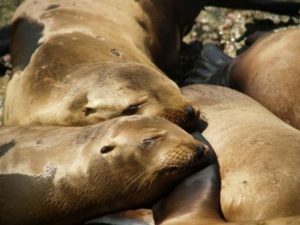 California sea lions are very social animals, and groups often rest closely packed together at favored haul-out sites on land or float together on the ocean’s surface in “rafts.” They are sometimes seen “porpoising,” or jumping out of the water, presumably to speed up their swimming. Sea lions have also been seen “surfing” breaking waves. California sea lions are opportunistic eaters, feeding on squid, octopus, herring, rockfish, mackerel, and small sharks. In turn, sea lions are preyed upon by Orcas (killer whales) and great white sharks.